Cultivating a slovenly dad bod usually takes a fair amount of work. Between letting your ancient gym memberships expire and spending every Sunday gorging on jalapeño poppers in front of a football game, developing a paunch is an art best left to the middle-aged pros. 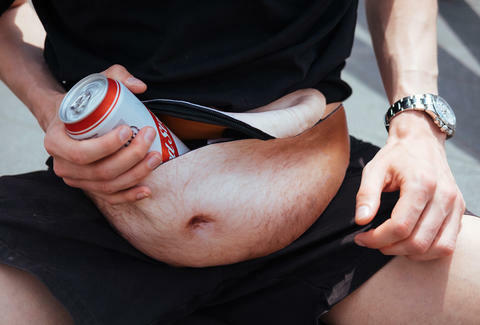 But if for some bizarre reason you'd like to prematurely join the ranks of portly dads everywhere, then London-based art director Albert Pukies has got a feasible solution: the Dadbag. Pukies' nascent Dadbags haven't been brought to market yet, but that could soon change now that the off-kilter items have experienced a fair amount of buzz online. The designer told London's Metro newspaper that the impetus behind the bag stems from a little jealousy — Pukies' for his part, would like have a dad bod one day — but he'd also like to promote awareness about the health problems associated with the flabby physiques. "I made the DadBag because I’m desperate to have a dad bod but I’m also very concerned about the health risks associated with it," he said. "The solution is quite simple, a bumbag with a proper dad belly printed on it. Now I can put on a dad bod whenever I feel like it and even store my valuables in it." Pukies is currently looking for suitors to help finance his dream of bringing his fanny packs to a barstool near you. Although no bags are currently in production, he tells Thrillist in an email "I’m looking for somewhere to produce them at the moment and I’m confident to see them before Christmas." According to Masable, he's mulling over launching a crowdfunding effort, so eager dad bod aficionados across the globe can contribute to the cause. And why wouldn't they want to? It only makes sense that in 2017 dad bod ownership isn't confined to an elite group of disheveled dudes wasting away in their armchairs and Honda Accords. If and when the Dadbag is brought to market, we can all do the democratic thing and masquerade as average, middle-age Joes. After all, it certainly wouldn't be the weirdest thing to sweep that fashion world in recent years.